The gilded grasshopper atop Faneuil Hall has an interesting history. Shem Drowne was a well known Boston coppersmith. In 1742, he made a copper grasshopper vane as a gift to Peter Faneuil, and it was placed on Faneuil Hall. The vane has been blown off the building a few times, and was then repaired and placed back on the building. 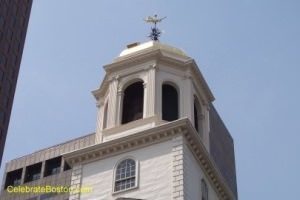 The vane was eventually gilded gold, presumably to harmonize with the gold dome of the State House. Shem Drowne died in 1774, and was buried at Copp's Hill Burial Ground. It is believed that the Faneuil Hall vane was modeled after the grasshopper atop the Royal Exchange in London. The Royal Exchange was built by Sir Thomas Gresham, and completed in 1571. The exchange became a center of world commerce. The descendant building was destroyed by fire in 1838, and a new Royal Exchange Building was opened in 1844. The name Gresham means "grass-farm," and one can infer the grasshopper atop the Royal Exchange was a symbol of the Gresham family name. An obscure American reference, from Edward McDonald's Historical sketches of Copp's Hill (1896), contains a story of a famous grasshopper vane in London. Further references have not been found by this author, but the story is still quite interesting: "A boy going home from school chased a grasshopper over a fence into a large field, and on climbing after the grasshopper he discovered in the grass a baby boy, which he took home to his mother, who brought up the boy and educated him; he afterwards became very wealthy and erected a large public building which he presented to the Town of London, and on top he placed a grasshopper vane, in commemoration of how he was found." As to why the symbol of a grasshopper was chosen by Peter Faneuil to be placed atop his new market in 1742, the most practical reason is the most probable. At that time, before several landfills were completed along Boston's waterfront, Faneuil Hall stood right at the shoreline. The London Exchange grasshopper was a globally recognized symbol of commerce. Peter Faneuil was a wealthy merchant, and his intent was likely to attract business to the new market by replicating the recognizable London symbol. Also, according to Yankee Weathervanes by Myrna Kaye (1973), a 4' x 4' sign in front of Faneuil's shop was also that of an image of the London exchange grasshopper. The historic grasshopper was stolen or vane-napped in 1974, and was thankfully repaired and returned to its home a few months later.